The Josephson effect is a fundamental quantum phenomenon where a dissipationless supercurrent is introduced in a weak link between two superconducting electrodes by Andreev reflections. The physical details and topology of the junction drastically modify the properties of the supercurrent and a strong enhancement of the critical supercurrent is expected to occur when the topology of the junction allows an emergence of Majorana bound states. 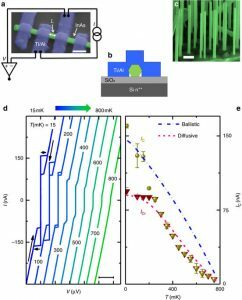 in the paper by J. Tiira (former Post-Doc student at NEST Laboratory) and collaborators, a group coordinated by Francesco Giazotto from Istituto Nanoscienze, CNR@NEST, has reported on Nature Communication journal charge transport measurements in mesoscopic Josephson junctions formed by InAs nanowires and Ti/Al superconducting leads. Their main observation is a colossal enhancement of the critical supercurrent induced by an external magnetic field applied perpendicular to the substrate. This striking and anomalous supercurrent enhancement cannot be described by any known conventional phenomenon of Josephson junctions. The researchers of NEST Laboratory consider these results in the context of topological superconductivity, and show that the observed critical supercurrent enhancement is compatible with a magnetic field-induced topological transition.